The Polish philosopher Czesław Znamierowski (1888–1967) was perhaps not a pur sang phenomenologist; however, he was significantly inspired and influenced by Reinach’s A priori foundations of the civil law. In 1921, a few years before Gerda Walther, Edith Stein and Dietrich von Hildebrand, he started publishing articles and books on what he called “social ontology.” The social ontology which emerges from these writings, and which we sketch out in our essay, is remarkably similar to, and yet no less strikingly different from, the social ontologies of these phenomenological classics, the latter no doubt due to Znamierowski’s at times not quite accurate criticism of Reinach, but even more due to Znamierowski’s own acumen and unconfessedly phenomenological insightfulness. We explain his conceptual apparatus, his “social acts” and “social facts”, his “social bearing” and “social function”, and the rest of it; we also amply illustrate this with examples provided by Znamierowski himself and by ourselves. We try to show that Znamierowski in virtue of his method, the substance of his thought, and also his style, and not just in virtue of the influences he had absorbed, was a de facto phenomenologist, even though he did not call himself such. 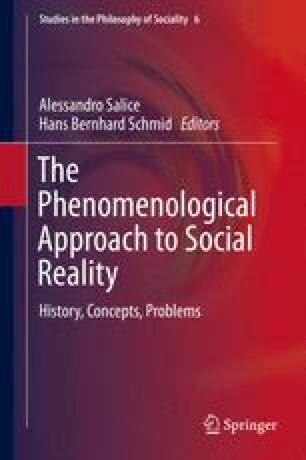 Last but not least, we attempt to demonstrate that Znamierowski’s social ontology is by and large correct and can be put to fruitful use even today, rather than be of merely historical interest. This article is the result of joint research undertaken by the two authors. The final written version of Sects. 4.2, 4.5 and 4.7 can be attributed to Giuseppe Lorini, and that of Sects. 4.1, 4.3, 4.4 and 4.6 to Wojciech Żełaniec. Both authors consider themselves responsible for every word of their joint work.